The Cannes Lions Press Grand Prix for 2015 has gone to “Never Stop Riding”, a campaign developed for The Public Bike System of Buenos Aires. “Never Stop Riding” brings awareness to Buenos Aires’ public bicycle system and its new automated system that includes an expansion of locations and hours of operation. The campaign is running in print and on outdoor billboards throughout Buenos Aires and is supported by advertisements on the wheels of the program’s bicycles. 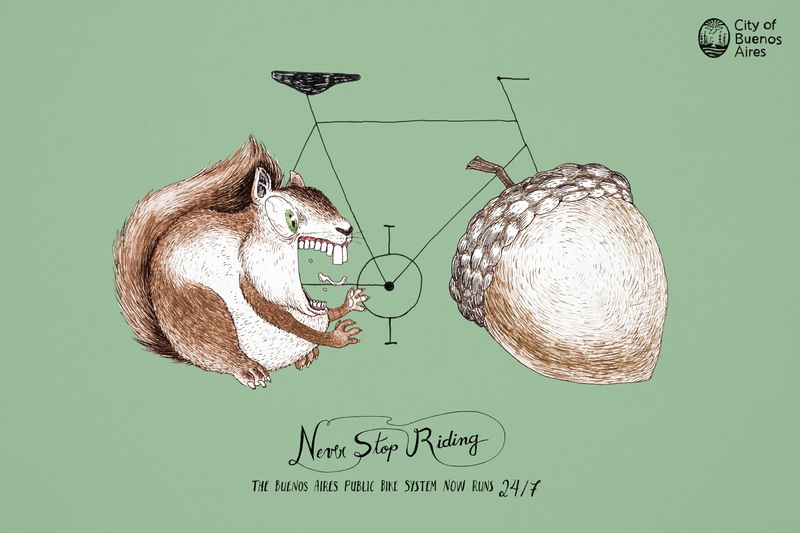 To communicate the new 24-hour availability of the bikes, the campaign uses illustrations to portray the wheels of a bike as partners in a constant chase – a baby chasing a breast, a dog chasing its tail, moths chasing a light bulb, and a squirrel chasing a chestnut. 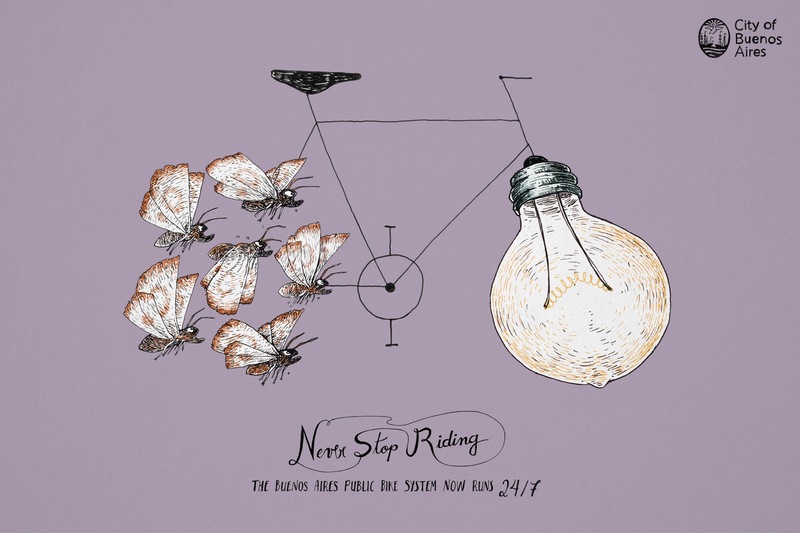 Each ad incorporates a hand-drawn typeface for the tagline, “The Buenos Aires Public Bike System Now Runs 24/7,” further evoking the movement of a bicycle chain. 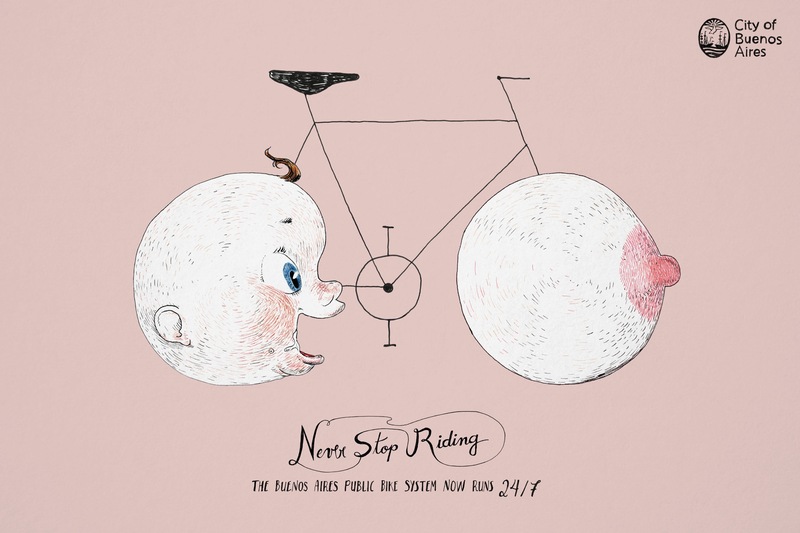 The Never Stop Riding campaign, developed at La Comunidad, also won two Gold Press Lions. Like many cities in the world, Buenos Aires has a public bicycle system. But until this year, the system was operating only from 8:00 a.m. to 8:00 p.m. In 2015, the city of Buenos Aires launched a new automatic bicycle system that operates full time—public bikes can now be used 24/7. This campaign is part of a program that started in 2010 with only 3 bicycle stations and an average of 100 trips per day. In 2015, there will be over 200 stations throughout the city providing more than 11 million trips per year. The campaign is credited with generating buzz around the ease and convenience of Buenos Aires’ public bicycle system – a program that revolutionized the city more than six years ago by creating not only more than 140 km of bike lanes, but changing the culture of how the city’s residents commute. By the end of 2015, there will be more than 200 bicycle stations throughout Buenos Aires. 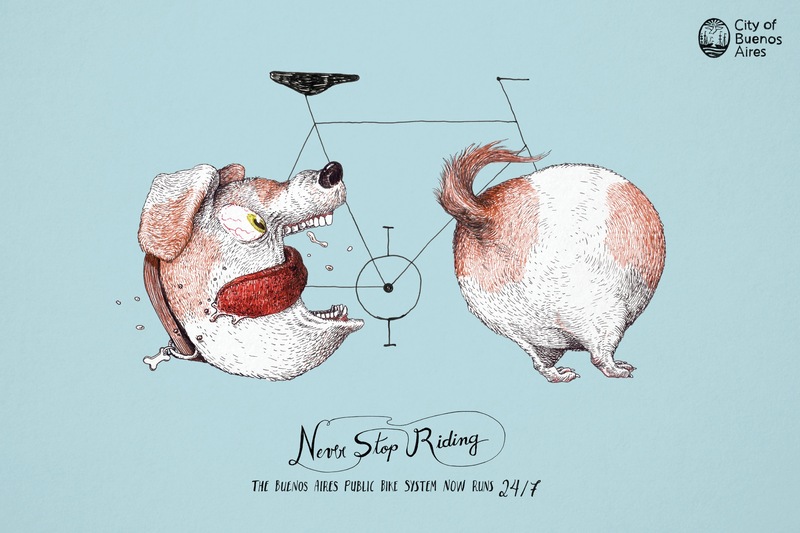 The Never Stop Riding campaign was developed at La Comunidad, Miami, by chief creative officers Joaquín Mollá and José Mollá, associate creative director/art director Fernando Reis, associate creative director/copywriter Marcelo Padoca, art director Guilherme Nóbrega, illustrator Arthur D’Araujo, editor/director Pablo Alberte, studio editor Sergio Skarek, group account director Sebastian Diaz, and account director Daniel Gergely.